Have you ever wondered what you could do to fancy up a dress form stamp? I wondered too until I came across this idea - make a lovely skirt for it!! I just fan folded two scraps of paper that I had cut with a decorative border punch. It only took about a dozen folds to get the skirt shape right. I stacked them and glued them over my stamped image. Then I just glued on a seam binding bow to cover the very top. 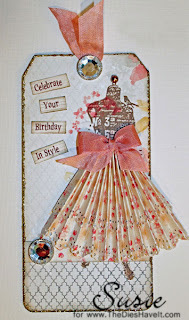 I added some large gem brads from Eyelet Outlet so that I could have some bling on my card and it turned out to be one easy peasy birthday tag! I hope you are having a great Saturday. I'll be right back here tomorrow with a brand new project for you.